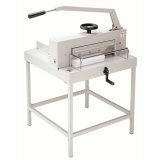 Manually Operated Paper Cutters - When the process quantity or budget does not allow for the purchase of a more automated cutter, a manually operated cutter will get the job done. If you're using a paper trimmer that cuts one to a few sheets at a time you may want to consider a paper cutter. Depending on the model, a manually operated cutter can easily cut through up to a 3" stack of paper in one swift stroke! 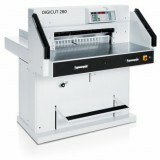 Electric Drive Paper Cutters - Automate your paper cutting with electric blade drive and clamping. Choose a model that offers automatic blade drive and manual clamping or combined automatic clamping and blade drive. Cutting length adjustments are made via a hand wheel at front of the cutter. The operator adjust the hand wheel while refering to a steel blade rule or a digital display to locate the desired cut length. 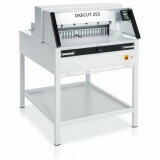 Programmable Paper Cutters - Precision cuts time after time is what you can expect from a programmable paper cutter. Cutting length is controled by the digital keypad which allows for programming repeat jobs. Simply enter the cut length on the keypad and press start for a quick cut. Hydraulic Drive Paper Cutters - Hydraulic drive paper cutters typically allow for clamp pressure adjustment. 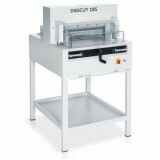 The operator can reduce clamp pressure when trimming delicate stock or increase pressure for a firm hold normally required for heavy card stock.